Not my best attempt, but hey, I got us on the ground! ...only on a flight simulator, but still, I crashed. I won't lie, I actually crashed several times. I get asked frequently if I’m a pilot or whether or not I have any plans on becoming one. The truth is that it’s just not something that I have a desire to do. I love flying with Zach, but as of now there is no part of me that wants to be the one in control of the aircraft. However, I do recognize that knowing how to get the plane on the ground in an emergency is a skill that, if ever needed, could prove lifesaving. So, we decided that a simulator is as good of a place as anywhere to start and we happen to have a friend that has one. We took a couple of hours this afternoon to play around with it, and let’s just say it wasn’t something that I was naturally good at! Zach started me on a Cessna 152, and I crashed it on landing my first try. While it still wasn’t pretty, I did eventually get the thing on the ground after a few attempts. Zach assures me that the controls of the sim are very touchy, so I shouldn’t be hard on myself. Of course he landed everything he tried to almost perfectly! This year I faced a health challenge that got the wheels turning for us on thinking about the “what ifs” even more than we used to. It turns out that I was born with a heart condition that, if not found and corrected, would have eventually caused a massive stroke. In fact, I was pretty lucky it hadn’t happened already. That got us thinking harder about the possibility of an emergency situation where Zach becomes incapacitated while we are flying. 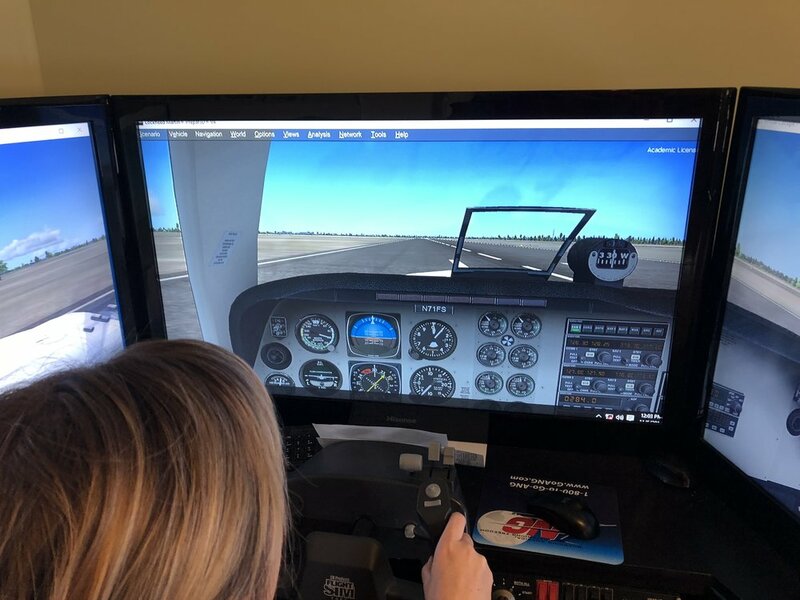 He has occasionally suggested over the years that I go to ground school or take a “pinch hitter course”, but he has never pushed me very hard on it. 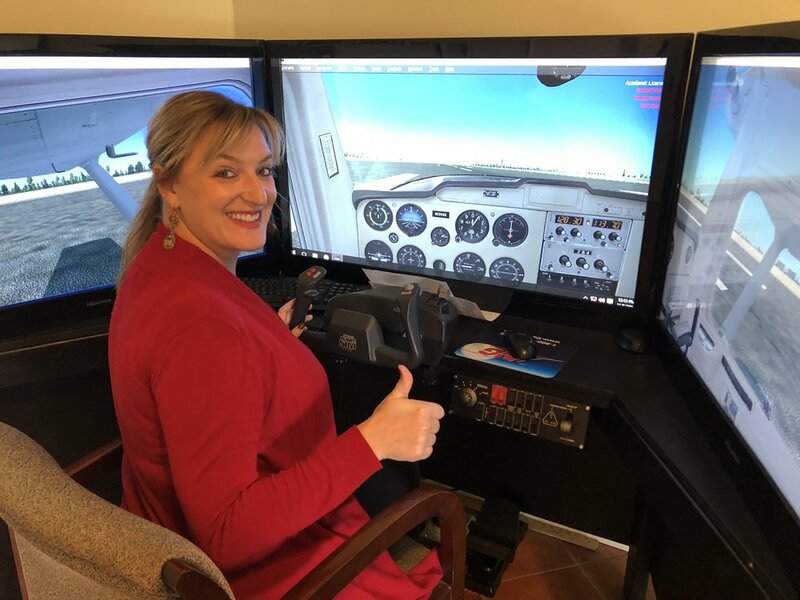 This health scare has been enough to push me to really work on learning how to land the plane. It’s not something I’m excited about or something I really want to do, but I know that it’s better to have taken the course and never need it than to need it and never have taken it. I am not a complete aviation novice. I have flown with Zach enough that I am pretty good at deciphering all of the radio chatter and I try to ask questions about all of the different instruments, so that I at least have a very basic understanding of what they do. I also try to pay attention to the things that Zach is doing while landing, and have even started having him to talk me through it each time we land. My thought process is that if he talks me through it enough then maybe eventually it will stick. I know that no matter how much I pay attention or how many times I practice landing on a simulator, while better than nothing, it still won’t prepare me for an actual emergency. I know it’s important and I know that learning how to do it is something I will never regret. So here I am, putting it out there for the world to see. I am committing to taking a pinch hitter course within the next year where I learn how to land the plane in an emergency situation. There are several of us spouses based at our home airport that have loosely talked about doing this for a couple of years. 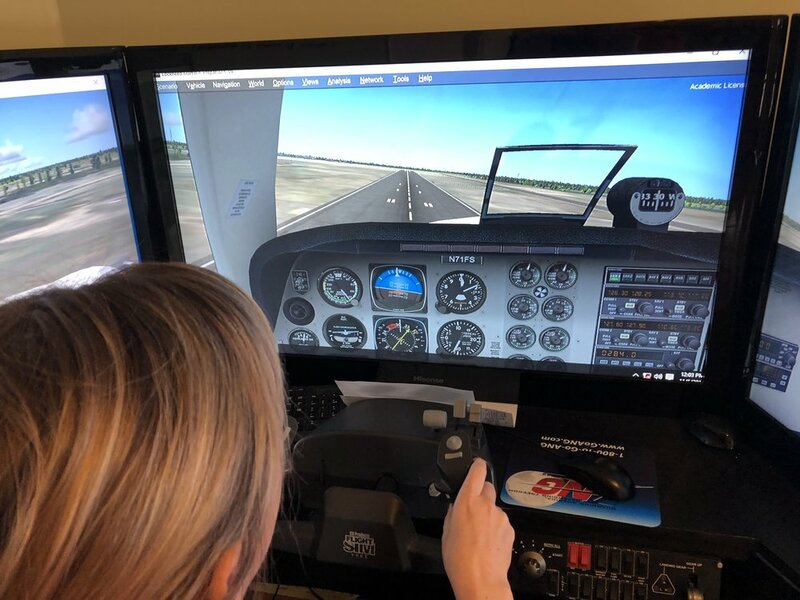 We are lucky enough to have an incredible CFI in our area that thinks it is a great idea, and has offered to head up the course for us. If there are any other accidental aviation enthusiasts (or their pilots who would like them to be prepared for an emergency) that are located around our area and are interested in this course, please reach out and I’ll keep you posted on the details as they develop!